On his ill-fated polar expedition of 1914-16, Ernest Shackleton and a companion set out to find help when their crew was stranded after the Endeavour was crushed in the ice of the Weddell Sea. After an epic of survival they reached the island of South Georgia, and as the two men trudged across the icy wasteland they each became convinced that a third person was walking beside them. T. S. Eliot referred to this in "The Waste Land" (1922), where it becomes a religious image. 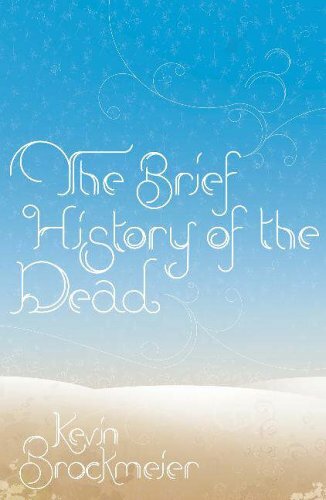 It reappears, multiplied, in The Brief History of the Dead , but here it is an image of memory, and memory in this extraordinary novel is equated with life. The novel is set in the near future, when climate change has forced the world's governments to give up on their responsibilities in Antarctica, and the continent has become the joint property of three corporations. Chief among these is Coca Cola, which decides to send a three-person expedition mainly as a publicity stunt; they are planning to use meltwater from the icecap, "the freshest water on the planet," in their drinks. The expedition, made up of corporate executives, is inevitably ill-equipped and ill-prepared. When they lose contact with the outside world, Puckett and Joyce set out to seek help, leaving Laura Byrd to await their return. They don't return, so eventually Laura is forced to set out after them. Interspersed with the chapters detailing the grim tale of Laura's long, harrowing solo journey across the ice (Brockmeier acknowledges how much of this is taken from Apsley Cherry-Garrard's 1922 account of Scott's expedition, The Worst Journey in the World ) are other chapters set in an unnamed and populous city. Where Laura's story focuses on one person in isolation, these chapters are about multitudes. Although certain characters recur—Sims the newspaperman, the unnamed blind man—they are rarely the focus of attention and will often disappear for chapters on end. Rather we have a kaleidoscopic view that shifts restlessly from character to character, from perspective to perspective. This, we rapidly discover, is the city of the newly dead, home for those still remembered by someone alive. Here, in a curious but superbly controlled mixture of the mundane and the magical, they live out some semblance of their former lives, sitting in parks, dining in cafes, working if they choose to, renewing old relationships or forming new ones. And all the while they debate, discuss, pass on rumour, batten on new arrivals to discover where they are, what is happening back home, what is going to happen next. The first chapter of this novel, which first introduces us to the city and its multifarious puzzled inhabitants, appeared as a short story in the New Yorker in 2004 and immediately generated a buzz among those looking for something new in the literature of the fantastic. It was quickly followed by news that there was to be a novel and a film, both of which stirred deep feelings of excitement and dismay in equal measure. How could something as whole and small and jewel-like as this perfectly formed short story survive the transition into either form? The prospect of the film remains unsettling, but the novel has proved to be as exquisite as the story, Brockmeier managing miraculously to sustain the same cool, haunting tone throughout. Opening up the story of the city only adds new layers of mystery and delight. All of a sudden the city, which had seemed to be growing endlessly, empties out. Strange tales are brought by the latest arrivals of a virus, which may have been man-made, which may have been unleashed as part of some new war, which may even have been linked to a guerrilla marketing campaign by Coca Cola. It is a virus to which no one is immune and which kills rapidly. Who is left now to remember the inhabitants of the city? But some inhabitants of the city do remain, gathering together in the urban heartland while empty streets radiate around them. Slowly, as they overhear snatches of conversation or happen upon someone they had vaguely known in life, they start to form a picture. The one connecting thread that binds them all to this continuance is Laura Byrd. Meanwhile Laura struggles across the ice, discovers an empty base surrounded by twenty neat graves, survives a terrifying fall into a crevasse, finds the radio transmitter that was her hope of contacting the outside world destroyed by a random act of nature. And around her, accompanying her, are all the people she remembers, family, friends, colleagues, casual acquaintances, lovers, strangers in the street. On Shackleton's expedition, miraculously, nobody died. Here the miracle of Brockmeier's glorious storytelling does not allow room for more mundane miracles: the novel ends as we know it must. Laura's narrative concludes with a mystical passage that is over the top compared to all that has gone before, perhaps Brockmeier's only failure of narrative voice in the whole book; the tale of the city concludes as kaleidoscopically, as hauntingly, as it began. The cumulative effect is probably the most beautiful novel of the end of the world that you are ever likely to encounter.